Hey mom and dad, which do you think is greater: the number of hours in your typical work day or the number of hours your kid interacts with media every day? According to a new report, you’re being outdone. Common Sense Media just released their latest study entitled The Common Sense Census: Media Use by Tweens and Teens. The massive research project looked at the “media activities” of more than 2,600 8-18-year-olds in America (“tweens” and “teens”) to discover how often they use media, for what purpose, and on what sort of device. Those of you who’ve been reading our Youth Culture Window articles for several years may remember a similar-sounding study produced by the Kaiser Family Foundation called the “Generation M” reports. The full report from Common Sense is well-written, loaded with helpful info-graphics, and available online (though you may be required to complete a simple registration form). However, it’s also quitelengthy due to the vast number of metrics they studied, for instance, age, gender, socio-economic backgrounds, and much more. So, I’ll highlight the biggest findings below, and end with a few questions that youth workers and parents should wrestle with as we help our teenagers navigate the growing influence of today’s media. Young people consume nine hours of media on any given day. Yep, nine (9) hours! That’s more time than most working adults put in at the office. That nine hours is filled with a combination of media activities like watching TV and online videos, listening to music, playing games on smartphones/laptops/tablets, surfing the Internet, using social media, and reading. 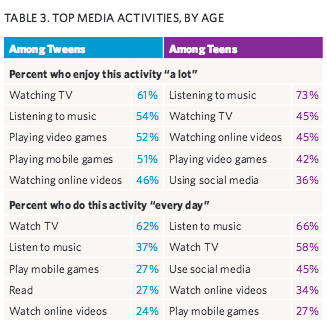 On average, tweens had a little less screen time (4 hours and 36 minutes) than teenagers did (6 hours and 40 minutes). However, these big numbers don’t necessarily represent every single kid in every single corner of the country. For example, approximately 6% of tweens and another 6% of teens said they might not use any screen media on some days.Speaking of differences in media use…. Boys and girls have very different media preferences and habits…with two exceptions. This is a bit of a no-brainer as there are tons of other differences between the genders, already. Some of the biggest distinctions in media use include the fact that boys really like playing console video games (think Xbox and PlayStation) and most girls don’t. But lots of girls really like reading, and boys, not so much.Of course, there are a couple of media-related things boys and girls can agree on, namely TV and music. Both genders claim to enjoy listening to music “a lot” and watching TV “every day.” As the chart shows , TV and music are the staples of young people’s media diets. This just goes to show, our kids are living in a world that’s dominated by iTunes and Netflix. Young people’s media use is highly mobile. Just because today’s kids are watching lots of TV and listening to lots of music doesn’t mean they’re sitting in front of a television set or stereo system. Those two elements – and plenty more – are available on mobile devices such as smartphones, tablets, handheld video game systems, and laptops. In fact, 44% of all screen time in tween and teen lives takes place on some sort of mobile device.There are lots of reasons why this is the new reality. For example, consuming media on mobile devices allows young people to get what they want on their time (for the most part). And given that most of these devices fit into a backpack – if not a pocket – it allows kids to access media on these portable screens during car rides, lunch breaks, and other times that technology couldn’t make available to their parents. Kids aren’t concerned about the amount of time they use media, but parents should be. Common Sense Media found that parents tend to be more concerned about the type of media their kids use rather than the time their kid uses media. 66% of teens and 84% of tweens said their parents had talked with them about the kind of media content they use, while just 53% of teens and 72% of tweens claimed their parents had talked with them about how much time they spend using it.Here’s just one place where the distinction becomes important: many young people multi-task their media usage with homework. Half of teens admit to “often” or “sometime” watching TV, or using social media, or listening to music whilst doing their homework. And, most of these teens don’t think their multi-tasking is anything to be concerned about. Big shocker, right? Nearly two-thirds of kids who multi-task their homework with media don’t think it has any impact on their academic performance. 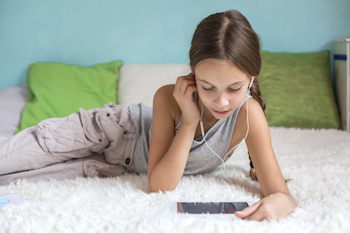 In fact, Common Sense Media discovered that 50% of kids think that listening to music may even help them work. The jury is still out on this issue. Some research shows that it’s possible for media to accentuate kids’ studies; others warn it may detract from their academic performance. Do you think nine hours of media use per day is too much? Why or why not? How would your life be different if you spent less time online, watching TV, playing games, etc? Why do you think TV and music are your generation’s favorite forms of media entertainment? What are some of the most frequent messages embedded in what you watch and listen to? In what ways does the screen you use (phone, tablet, computer) determine your media choices? In spite of the fact that so much media is consumed on personal mobile devices, what are some suggestions you have for helping our family use media together on a more frequent basis? What boundaries do you need to set for yourself to help you manage your media usuage? As an adult, what can I do to help you make solid, healthy, godly media choices? Feel free to augment this list with your own ideas. The main thing is that we as parents and youth workers continually communicate with our kids about their media choices.